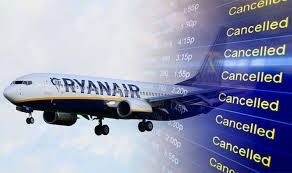 About 300 flights have been cancelled by Ryanair in response to the coordinated 48-hour strike by cabin crew in Belgium, Portugal, Spain on Wednesday and Thursday, on a dispute over range of pay. Ryanair today announced that it has signed its third cabin crew union recognition agreement with Ver.di Union. Ver.di will now be the representative body for all directly employed Cabin Crew operating on Ryanair aircraft in Germany.